As part of Luminato and of Canadian commemorations of the bicentennial of the War of 1812, the Canadian Children’s Opera Chorus is presenting the world premiere of Laura’s Cow: The Legend of Laura Secord. The 70-minute opera with music by Errol Gay to a libretto by Michael Patrick Albano is a charming work written to include all levels of the 200-voice CCOC from oldest to youngest plus three professional singers. Told with abundant humour and imagination, this is an opera destined to last beyond its specific occasion to become a permanent part of the CCOC repertoire. As with other historical characters who have become the stuff of legend, there is some disagreement about what Laura Secord actually did and how. Albano sticks to the most accepted facts that Laura, née Ingersoll, (1775-1868) moved with her loyalist family from Massachusetts to Upper Canada. In 1797 Laura married James Secord and settled in Queenston. James, a sergeant in the 1st Militia, was wounded in during the Battle of Queenston Heights. The Americans sequestered property, including the Secord farm, to billet their soldiers. On the evening of June 21, 1813, Laura overheard the Americans planning a surprise attack on British troops led by Lieutenant James FitzGibbon at Beaver Dams that would lead to American control of the Niagara Peninsula. Her husband still incapacitated from his wound, she set out alone to walk the 32 kilometres through enemy territory to warn FitzGibbon herself. She took a cow along with her so she could claim she was taking it to sell at market. She collapsed a short distance from Decew House, FitzGibbon’s headquarters, but was able give her warning in time leading to a British victory at the Battle of Beaver Dams. Albano’s begins the opera in the present with a school class preparing a play to celebrate Laura Secord during their study of the War of 1812. Suddenly Laura herself (Emily Brown Gibson) appears to tell the children and their surprised teacher what really happened. It transpires that what “really happened” actually involves quite a lot of fantasy but those fantastic elements are what will attract children to the story and help enliven the history. A Balladeer (Andrew Love) becomes the narrator to set scenes and jump from one episode to the next. He first appears as a square dance caller to lead into the scene of James Secord (Ivan Yordanov) courting Laura. We shift from the human world to the animal world of the Ingersoll farm with its choruses of goats, sheep, chickens and pigs that introduce in grand style Laura’s Cow (Marta Herman). A life-sized Trojan cow is pulled in out of which Herman pops to deliver a humorously bluesy number consisting entirely of the word “Moo”, after which she leads the barnyard animals in a boisterous Charleston. The scene is so much fun it is really beside the point to ask why Errol Gay has identified the animals with music one hundred years in their future, except that one sub-theme of the opera is that animals are more advanced than we are because they are much more aware of their environment. The most fascinating scene of the opera is also the most dramatically and musically advanced. Laura, who feels helpless after James is wounded, goes to a church service where the congregation – men on one side women on the other – are singing a hymn. In between verses, the chorus sings directly to Laura to be prepared to do something important when the time comes. The effect is psychologically astute since Laura wonders whether it is God or her conscience speaking to her. As we know, the occasion does arrive and urged on by her cow, Laura does take action. Albano dramatizes her 32-kilometre trek by having her journey overseen by Ojibwe-speaking Native Guides and by her encountering various animals along the way – a bear, a colony of industrious beavers, a pack of untrustworthy coyotes and a herd of trustworthy deer. At Decew House, Albano brings out the detail that the British soldiers won’t at first take Laura seriously until she defiantly insists on seeing FitzGibbon (also Andrew Love). His praise of her gradually builds into a massive chorus encompassing the entire cast in praise of Laura, of Canada and of ordinary people having the power to do extraordinary things. It is a wonderfully uplifting sequence and beautifully sung. The overall nature of the opera is most reminiscent of Benjamin Britten first opera Paul Bunyan (1941), with its singing animals and eclectic mix of mood music and period-inspired tunes. Gay draws a wide range of effects from the 14-member orchestra. Its orchestral interludes sometimes sound Debussyan, sometimes like that of the great European exiles who scored so many films in the 1940s. 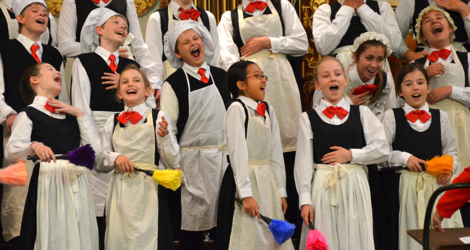 Gay is keenly aware that music for a children’s chorus must be clearly rhythmic and melodic. His arias grow out of the atmospheric music but the textures are perfectly judged to suit the voices they are meant to accompany. He shows his modernity in creating unusually tangy harmonies by having the voices join in one by one to create a final chord. Besides the remarkable church scene and the rousing finale, perhaps the single loveliest song is the one about the wedding veil that he writes for Laura’s maid-of-honour Emma (Jacoba Barber-Rozema) that is filled with both the joy and sadness of a friend seeing another move on to another stage in life. Emily Brown Gibson, who has been a member of the CCOC for six years, has a string, clear voice that will surely acquire more fullness when it matures. She gives a very winning portrait of Laura, not as an overblown figure, but as a good, seemingly unexceptional person who sees what is the right thing to do and does it. All the flamboyance of heroism Albano and Gay give to Laura’s Cow. Marta Herman is a delight throughout. Her mezzo-soprano combines brightness and depth and she has the panache to make her character the most memorable in the opera. Andrew Love has a heroic baritone and fine acting abilities which help explain the long list of opera engagements he has lined up in the future. Special praise must be given to costume designer Lisa Magill who has found ingenious solutions to the many challenges the opera poses. Her cow outfit for Herman is exceedingly witty. She has pants and a blouse with a black-and-white splotch design, white rubber boots with black toes and a pink shoulder bag decorated with a row of what look like pink basting bulbs. The beavers are also wonderful with their brown mining hats, brown overalls with dependent quilted tails and wooden sticks, sandpaper and trowels for dam-building. Her designs along with Fred Perruzza’s specialty props make the show a visual as well as musical pleasure. CCOC Artistic Director Ann Cooper Gay conducts the orchestra and the singers with verve and precision. Especially notable is how clear the diction is across the board – something that is hard to find even in all adult companies. If you’re looking for a Luminato event for you and your family, this is an ideal one to choose. Laura’s Cow runs at Harbourfront’s Enwave Theatre, 231 Queen’s Quay West, Toronto, June 7-10. An alternate cast to the one discussed sings on June 8, June 9 evening and June 10 afternoon. Note: A version of this review also appears in The WholeNote Blog 2012-06-08. Photo: The Canadian Children’s Opera Chorus in Laura’s Cow. ©2012 Michael Cooper.